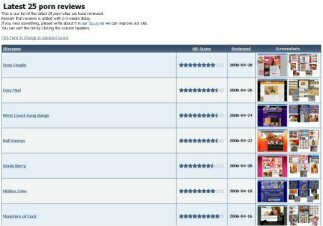 From here you have the grand overview of all the 900+ sites we have reviewed. You can access these reviews in several different ways. - If you want to see the latest month's or so reviews, choose to see the latest 25 reviews. - Another way is by browsing the complete list in alphabetical order, chronological order or listed by overall score. Click the headings to change sorting. - If you want to see only the best of the best, choose to view our toplist reviews. Here you will only see sites with an overall score of 9.0 and above. - To see all sites that are part of a specific category, just click any category to the left. A review can be part of several categories. - If you know any part of the name of a site, just type it in our search field to the left. Note that you always have the possiblity of changing the layout of the tables to show screenshots of the sites.